Proof of Stake (PoS) is related to the term Cryptocurrency world. It is now being very competitive among the crypto miners. It was created to tackle inherent issues. After making a transaction, a block with the maximum capacity of the 1-megabyte store the transaction data. Then, multiple nodes or computers on the network duplicate these data. 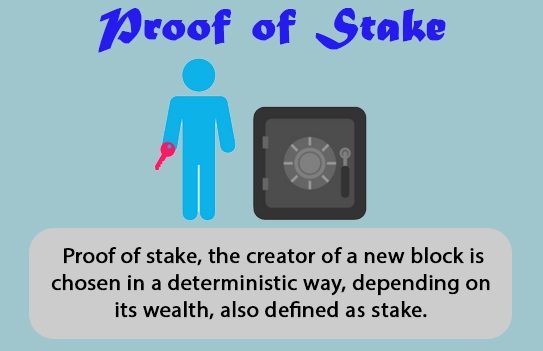 So, what actually a proof of stake is? According to the power of holding coins, a person can mine block transactions. Which is indicating that the more a miner holds Bitcoin or altcoin, the more mining power s/he has. Generally, as a cryptocurrency, Peercoin first adopt the PoS. Subsequently, Blockchain and ShadowCoin also started to follow it. Importantly, nodes are regarded as the administrative body of the blockchain as well as legitimacy body of the transaction of each block for the first step. Secondly, Proof of the work problem, which carries out the verification step for the nodes and miners, so that they can solve a computational puzzle. Thirdly, the first miner gets rewards with coin after solving the block puzzle. Sometimes it worth 12+ Bitcoin, which is too much. Finally, after the verification of block transactions, it is added to the blockchain. The proof of stake seeks to address this issue with ability or the power held by a miner. This power defines the proportion of coins s/he held or mines. For instance, if a miner own 4% of the total Bitcoin available can mine only 3% of the blocks. 2. Work submission is hashed 10 times consecutively. Likewise- it is the lottery system for two sets of five winners. The first five winners hash map to the mandatory signature and other five hashes are regarded as the voluntary signature. 3. If the mandatory signatures set the map to active public keys. Then Blockchain considers this block potentially as valid. If not, the block must be discarded. 4. If PoW miner finds a valid block, then, s/he transfers the hash to the network. 5. The first five selected mandatory signatories sequentially valid or sign this hash and transmit it onward for work submission. 6. After the completion of signature of mandatory signature, the final signature publishes the Proof of Work (PoW) block as well as their own Proof of Stake (PoS) block. 7. The final five hashes are here regarded as voluntary signatures. These voluntary signatures are kept to inserted into any blocks for next 6 blocks as special txns. These txns are completely free, therefore, they cost nothing. The attacker must have to own the majority of all bitcoin. Likewise- if an attacker wants to obtain more than 50% or 52% of the Bitcoin, then he must have to own 52% of all Bitcoin. Therefore, the attacker consequently suffers from his own attack.